Rain and wind have driven the last of the leaves from the deciduous trees in my garden, and a hard frost finally blackened my coleus a couple nights ago. There’s no denying the end of the growing season has finally arrived. Fortunately, a few shrubs still bring colorful foliage to the garden even at this late date. 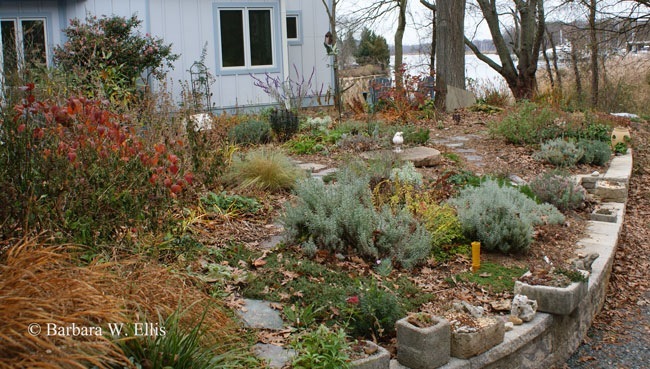 ABOVE: Shrubs with colorful fall foliage combined with evergreen lavenders, thymes and other plants fill the late fall garden. 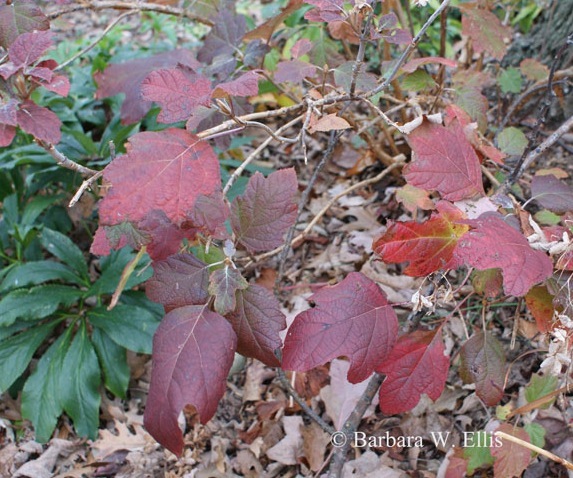 Year round, one of my favorite shrubs is oakleaf hydrangea (Hydrangea quercifolia). This dependable native brings glorious fall foliage to the garden every year, and also produces luscious white flowers in summertime. I have to say in Ohio, where I was raised, the flower buds often didn’t survive the winter, so the plants didn’t bloom. We grew it anyway just for for the deep greens of summer and the glorious fall foliage.